DICE are still pushing out content updates for Battlefield 4, and this autumn players will be able to pick up the big Fall Update. But not only will they get the seasonal update, but also a special new map that has been made with the help of the community. Looking to lock and load? Try one of the best shooters on PC. Community Operations is a free map that was built – from conception to final design – with the help of Battlefield 4 players. 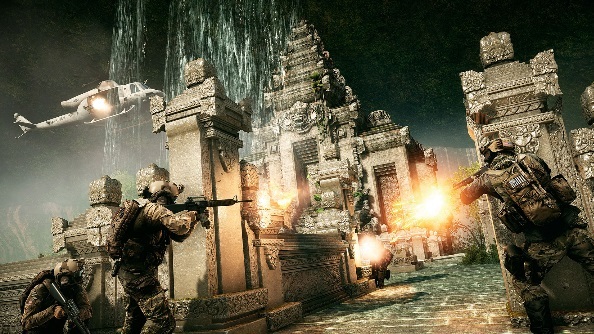 It’s a fast-paced jungle map with narrow access points, infantry-heavy zones, a medical facility, temple, and a waterfall. Vehicles on the map are of the nippy, fast persuasion, such as ATVs and bikes. You can see it in action in the trailer above. DICE will be revealing more in-depth information on Community Operations closer to its release date, which they have yet to announce. Expect to see something in the coming weeks though.